Almost 400 faculty and staff members gathered at the Memorial Student Center to hear Young’s address ‑ his third since becoming president in 2015 – as he addressed major events, challenges and opportunities from the past year. Young kicked off the address by celebrating the university’s strengths that were on display during the past year. Strengths included a commitment to academic excellence, the university community’s dedication to its core values, fiscal accountability to the state, maintaining affordability and a high return on investment for students. Looking ahead at the upcoming year, Young laid out four strategic initiatives and presented expectations and progress updates on each. Young announced goals to raise the current first year retention rate of 92.2 percent to 95 percent, increase four-year graduation rates to 65 percent and increase six-year graduation rates to 85 percent. Young shared construction updates on the Zachry Engineering Education Complex, the 21st Century Classroom and many more. Provost Carol A. Fierke has assigned a task force of more than 50 people from across the university to take a deep dive into student success needs and present the first in a series of action plans on Nov. 5 with more recommendations expected in the spring. Research support: In addition to President’s Excellence Fund, the Research Development Fund will include millions more in funding. In the last three years alone, more than $25 million has been invested – a commitment that is being renewed for the next five years. Faculty hiring: Young reaffirmed his commitment to recruiting top-tier faculty and set a goal of adding 30 additional tenure track professors in the next 12 months and 100 new faculty over the next five years. Support will come from a variety of sources, including central administration funds, the Chancellor’s Research Initiative, the Governor’s University Research Initiative, funds from the respective colleges and philanthropy. Young provided his first major update on the progress of the $100 million, 10-year President’s Excellence Fund since its introduction at last year’s State of the University address. At the heart of the fund are T3 grants, an interdisciplinary seed-grant program for interdisciplinary teams to develop research partnerships, and X-Grants, which aim to unlock creative solutions to the most important challenges facing global society. Last year, a total of 100 T3 projects, at $30,000 each, were awarded to faculty teams for a total of $3 million. At least half of the funded teams included an assistant professor. An additional $7 million dollars was awarded in larger “X Grants.” Young encouraged faculty to pursue funding through these programs. Young noted that the Lead by Example campaign, which launched in November 2015, is now raised $3.3 billion toward its $4 billion goal. He acknowledged another important milestone reached when discussing the Vision 2020 campaign, which is nearing its conclusion after launching in 1998. Since its launch, 100 national academy members have joined the university and research expenditures have reached nearly $1 billion per year. With Texas A&M’s Hispanic student population reaching 24.6 percent, the university is now .4 percent away from being designated a Hispanic Serving Institution (HSI). Young said the university is expected to achieve HSI designation in the next two years. Young added that in May of 2019, Texas A&M is expected to surpass 500,000 living former students across 165 countries around the globe, over half of whom graduated after 1997. “The Aggie Network is global, and our future is bright,” Young said. Young pointed out that Texas A&M and the state of Texas were in the process of recovering from Hurricane Harvey during the last State of the University address. More than 33,000 students, faculty and staff were from areas affected by the hurricane, each of them played a role in recovery. He thanked the community for stepping up to serve in an “all hands on deck” scenario. This included Texas A&M System Chancellor John Sharp selected by Gov. Greg Abbott to be the Hurricane Recovery Czar for the Commission to Rebuild Texas, faculty taking part in rescue, recovery and rebuilding efforts and university staff who continued to serve campus and meet its needs. “We are a resilient state, and Aggies are a vital part of that resiliency,” he said. Young recalled that while recovery efforts were still underway, Texas A&M hosted every living former United States president for the One America Appeal hurricane relief concert at Reed Arena, which raised $42 million to help storm victims in Texas, Florida and Puerto Rico. Six months later in April of this year, Texas A&M was once again serving in the national spotlight as First Lady Barbara Bush was laid to rest on campus at the George H.W. Bush Presidential Library. 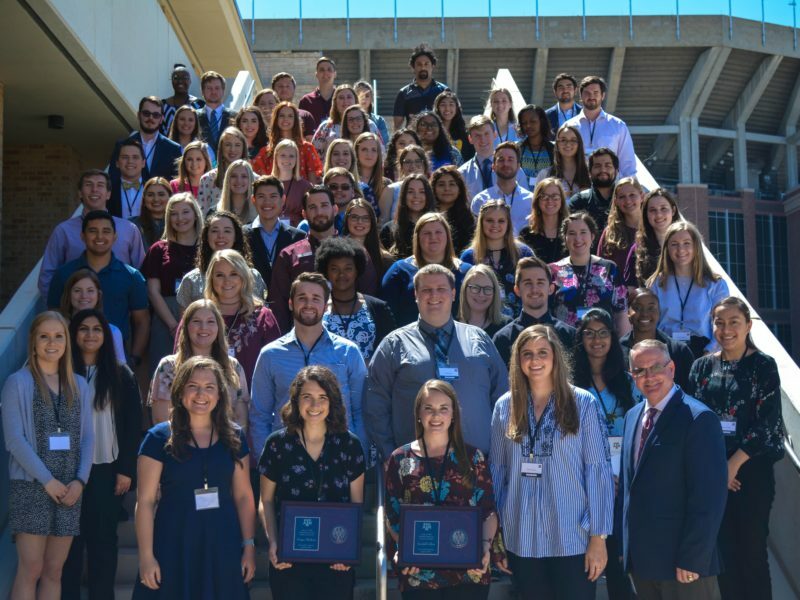 While Texas A&M was presented plentiful opportunities to serve the state the nation and the world, the university was also faced a challenge to better serve students victims of sexual assault through Title IX investigations, Young said. He discussed how over the summer he ordered internal and external reviews of the university’s Title IX investigation process in response to criticism. Young said that the reviews and convening with experts in trauma-informed investigations, student and former student sexual assault survivors, and members of the local community yielded a set of actions, some of which were implemented with immediate effect upon announcement in August, and others, which are currently under study to be implemented. This included a student sanctioning matrix that is in place. A similar faculty sanctioning matrix is underway. As he prepared to close out his remarks, Young took a moment to honor philosophy professor Dr. John McDermott, who was hailed as one of the world’s most influential philosophers at the time of his passing on Sunday at age 86 after more than 40 years at Texas A&M. Young then asked all in attendance to serve McDermott well by embracing the essence of what it means to be an Aggie. “As we walk out of here today, let us do so with a firm resolve and the heart to embrace our core values in all that we do, to truly be present in life in service to others, and to always remember that what we do matters. This university matters,” Young said.